The Great Indian Tiger has from times immemorial kindled man’s fantasy. Maybe deep within primitive man admired it so much that he tried to emulate the ways of the tiger? In India the tiger is associated with Goddess Durga. Performed around September - The Tiger dance –- called by various names depending on the region it is performed is a well known folk dance – usually seen during Dussera / Navarathri [ the 9 night’s festival]. Huli Vesha or Puli Vesha – as the tiger dance is known in Karnataka and Andhra Pradesh is performed during Dussera and Muharram by both the Hindus and Muslims. The dancer paints his body in yellow varnish with black stripes resembling a tiger, on his face he wears a tiger’s mask , his long tail is made of cloth and he wears bells only on one leg . 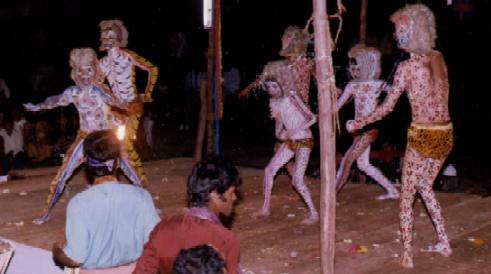 The tiger dance, also seen in Orissa, is known as the Bagh Nritya. 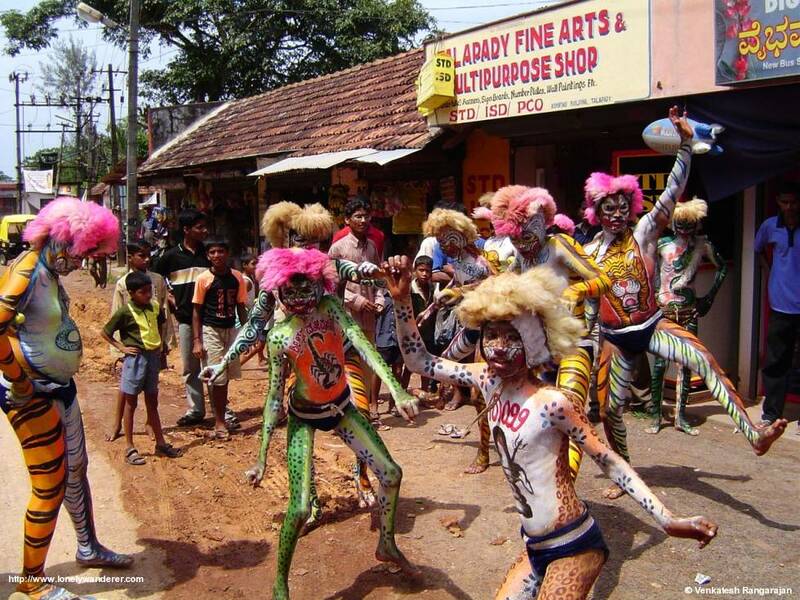 Tiger Dance is a unique form of folk dance in Dakshina kannada that fascinates the young and the old alike. Since tiger is considered as the favored carrier of Goddess Sharada (the deity in whose honor Dussera is celebrated), this dance is performed during the Dussera celebration. It is also performed during other festivals like Krishna Janmasthami. There are more than 50 troupes who perform this famed folk dance. Popular and probably the oldest one among them is the Kesari friends circle group headed by Bajilkeri Kamalaksha. 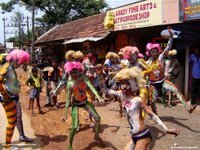 The Mangalorean style is distinctive by its body paint, the satin chaddi or knicker and the headgear which is made of papier-mache and adorned with raw wool - the 'fur' of the Tiger. The grand Hulivesha performance is preceded by a long body painting session. Several layers of paint is applied on the artist's body carefully. Each layer is applied such that the end result reflects the grandeur of the carnivore. Typically the body colour is layered with yellow and black colour with occasional touching of red near the mouth. During this period which lasts several hours the artist stands erect so that the paint doesn't get distorted. Hulivesha is accompanied by the familiar drumbeat which can be heard from very far off places. On hearing the beat, herds of children flock to place where the dance is being performed and start moving with the troupe. Every child in Kudla can play the popular Hulivesha drum rhythm (of course with their mouth). We wish we could play it here. During the dance the artists perform many heroic acts which depicts the power of the carnivore. 'Killing sheep' is one the famous acts performed. A skillful tiger dancer is expected to kill a sheep, which means the artist holds the sheep by his teeth toss it in the air and throw it away. The sheep is not actually killed and it is only a ritual. Many such acts are performed, some of the popular ones being picking the note with his mouth by bending backwards, swinging the mace etc. A typical troupe consists of 7-15 members. But there are troupes of much larger sizes also. The formal dance begins with a Ganesh pooja following the Navarathri festival. The tiger dance occupies a prominent place throughout the Dussera procession. It is a tribute to the royal cat which is the favored carrier of many gods and goddesses. © 2006 Venkatesh Rangarajan - All rights reserved. 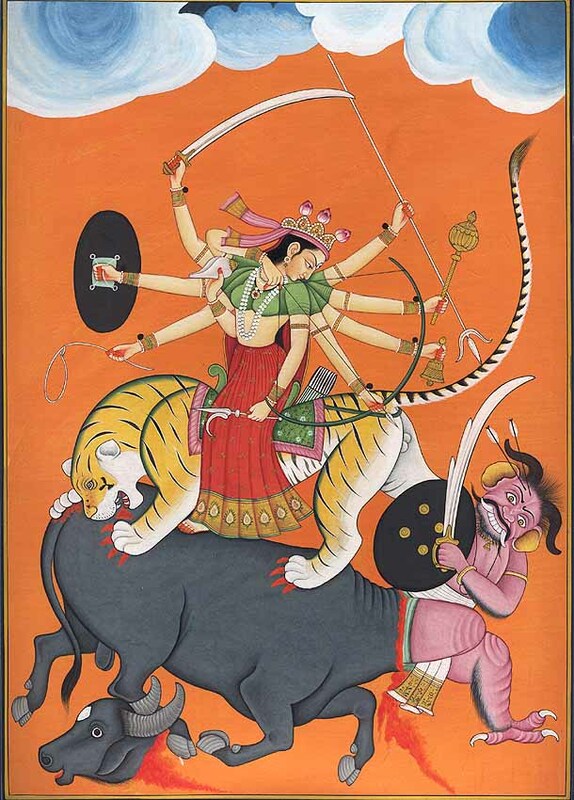 With her golden body blazing with the splendor of a thousand suns, seated on her lion or tiger vehicle, Durga is one of the most spectacular of all personifications of Cosmic Energy. In February 1999 a four month’s old one-footed female tiger cub came to the monastery in a bad condition with a sign of alarm whenever she heard a popping sound of can opening. Her head was stitched. Her eyes were dimmed and she could see things only at a very short distance. The claws of her front legs were removed. She had blunt teeth and could chew and swallow foods only with difficulty. She was upset and roaring as she ate and kept wandering around but she never hurt anybody. According to a narration, the baby tiger eluded from being killed and stuffed at the Thai-Myanmar border. Her mother was believed to be shot dead. The monastery thus looked after her and she stayed alive. The event brought sympathy to all the persons who took part in saving her life and nobody would expect to see such case again. Yet several other baby tigers were brought to the monastery with almost the same story. There are some fertile forest areas along the Thai-Myanmar border where a small population of tiger still exists. The areas are difficult to access and control and it is unfortunate that many tigers end their lives from being poached. Not knowing how to do after killing their parents, the tiger cubs are brought to the monastery where it is regarded as a land of mercy. Read more about this wonderful project. While the tiger is not always easy to see in this region of mountainous plateaus and rugged ravines, its presence can be felt: "While exploring the ruins of the Hindu kingdom, we came upon a little lake with a small temple perched perfectly on a peninsula. We were there at midday, but in my mind's eye, I saw it at dawn, or by moonlight, perhaps twilight. There could be a tiger, emerging from the shelter of the temple, looking out over the lake." The Tiger, Priest Bukan and the "Four Sleepers"
***** . Muharram festival . 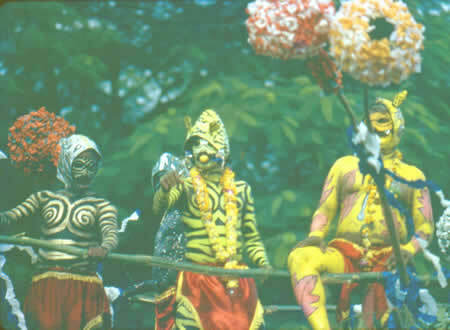 The Pulikali, also known as the tiger dance, is part of the Muharram celebration in Kerala. Some Muslims paint their bodies with tiger markings, wear masks, and parade through streets . . .
but that is only with masks, a Chinese tradition, performed in China and Japan and other Asian countries. Shijuu (四獣,四聖獣）with the White Tiger 白虎 in the West, a road in the West of a city layout. "I had come back from Nagasaki to Tokyo. It was in early summer at some lake in the mountains, all was lush and green and a tiger could easily be hidden in the shadows. In my mind, the lake became my sphere, the tiger shadow lay there all black with my expectations." He had differences with Nakamura Kusatao and started the new Gendai Haiku Kyokai in the same year. One can imagine that the tiger in this haiku is Tohta himself.
. Tora トラ　- 虎　- 寅　the Tiger Toys .
. Tigers in Sunderbans, India, By ROWAN HOOPER .